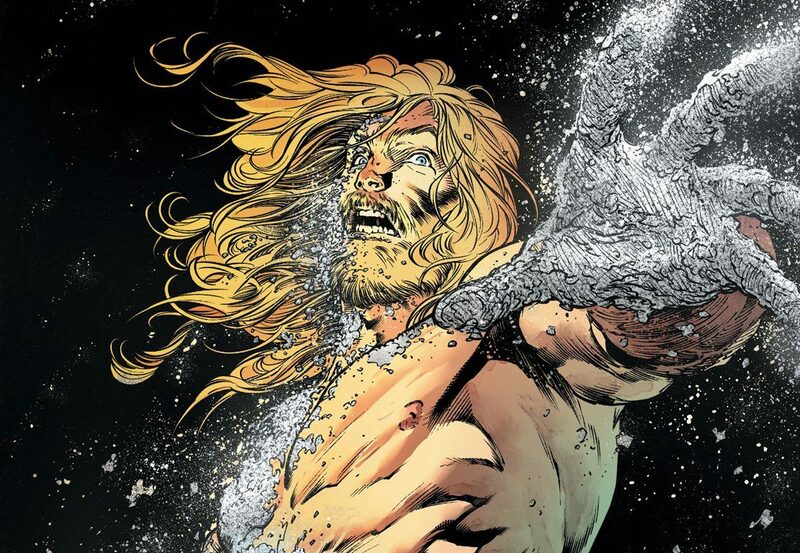 Aquaman #46 review: The Call – AiPT! Kelly Sue DeConnick and Robson Rocha’s Aquaman has been a breath of fresh air. Moving the hero beyond Atlantean conflicts, the work has taken him into the realm of pure myth. Surrounded by gods, monsters and strange mysteries, the hero is now on a quest to bring balance to the oceans. Confronting Namma, who is Mother Salt, one of the primordial beings of existence and the ocean itself, Aquaman stands between her and the end of all things. All she needs is to absorb The Calleach, the last of her 7 Monster children, hidden within Callie. Once accomplished, she’ll have returned to the absolute peak of her power and then the twilight of not just the gods but all of existence begins. As this struggle rages on, The Oceanic Gods of the universe, all united in the village of Unspoken Water convene. Feeling a profound sense of shame in their inaction and the usage of these mortal beings to resolve what is their problem, they agonize over what’s occurred and more importantly, what may be about to. Rocha, teamed with Daniel Henriques and Sunny Gho, really gets to flex his skills here, moving between the smaller village meetings to the more grandiose dealings with monsters. The art team’s take on Namma is particularly inspired and chilling. Rocha, as inked carefully by Henriques, comes off as an interesting blend of elements from the works of Greg Capullo and Ivan Reis, while being his own distinctive beast at the same time. His lines and textures clearly stand out, as to his clearly delineated characters and their expressions, making for a fascinating art style. Gho’s cool colors, weaving through storms, salt and fantastical powers are very much a key ingredient here, ensuring the book attains the tone and sense of atmosphere it needs. Simultaneously, Cowles continues to do great work here as always, balancing DeConnick’s script with the art team’s work. The simple green boxes with white text, which never feel overly extravagant or too flashy and stylized, but are simple enough to serve the purpose give the book its matter-of-fact mythic sensibility. Apart from that, his choice of wavy and chaotic balloons for The Calleach is fantastic, getting across the erratic tension and wild power of the creature. Thicker black outlines for Namma’s balloons, which tend to be just uneven enough here and there (like the ocean! ), are also solid decisions, helping give the character more ‘weight’ and a powerful presence and a sinister vibe that rings with ancient, unpredictable might. Even the bent balloon tails like a shaky, untrustworthy mist tell you all you need to about the character, as Cowles does storytelling that is essential but easy to miss, because of how well executed it really is. The issue, which is fairly action heavy, is chock full of fun character moments that escalate the narrative to new heights. Namma is a fantastic saltbender, which feels like a rather obvious and simple idea that should’ve been around in Aquaman for ages. And yet, it hasn’t. That’s one of the fun things about this new spin on the character. It adds a whole slew of ideas that scream ‘well, why didn’t this exist before?! It totally should have!’ and feels additive in a rather meaningful way. The entire run grants the title and its titular character a mythic dimension he’s historically lacked and it does it with such inspired decision-making that it’s almost gleeful. This new run understands the elemental power inherent to the entire concept and capitalizes on it, giving us super salt-bending foes and divine oceanic pantheons. And if one looks closer, it’s evident what the book is really doing, on top of all of that, to elevate things to the level it wants. The premise is, more or less, in broad strokes, a sort of Ragnarok, if you will. It’s The Twilight and Fate Of The Gods and Arthur, akin to Thor, fights the giant serpentine monster that threatens to devour everything. Namma, or Mother Salt, is essentially the Jörmungandr of this Aquatic Epic and those mythic parallels are explicit in the telling of the story. This is not a narrative of the Atlantean council’s political agendas, this is one where Aquaman wrestles Sea-Dragons on the verge of cosmic apocalypse, as the Gods convene to contemplate their next move. But despite all of the above, the story never loses itself or its characters and eternally remains true. Arthur Curry may go by Andy and he may lack his memory, but his essence is still the same. He’s still the selfless hero leaping into trouble in order to aid those in need of help. He’s a quick thinker, he’s a man of reason and he’s also a fighter. But most importantly, this traditionally masculine bearded shirtless badass is one more thing, the thing that is perhaps the most important. He’s a man with one true defining power, the one everyone knows, the one everyone loves to mock and sneer at. He’s a man of might whose one real distinct and defining ability is to ask for help. His power is The Call, the ability to talk to fish and all aquatic life in general. DeConnick, Rocha, Henriques, Gho and Cowles all understand the importance of this power and they proudly and loudly engage with it, showing off its noble and radiant strength. The ability to ask for help is no sign of weakness, nor is it lame, it’s the mark of true strength, a true hero and it’s something we all need. Aquaman represents us on that cosmic scale and that ability is essential to who he is and what makes him the Champion Of The Seas. Without a hint of defensiveness, the book embraces, adores and loves Arthur and shows us what makes special as a character. It’s a joy to witness. Aquaman #46 continues the fantastic new run that is diving deep into myth and character to unveil powerful facets of the core character. In stripping away all the conventions we attach to him, the creative team has found a way to present him in a new way without baggage, whilst also honoring all that came before. Sea-Dragons, Oceanic Ragnarok and Salt-Benders, this is the elementally awesome and mythic Aquarun you never knew you wanted but desperately need. Cowles is a phenomenal pick for this book. Much like Wands before him, he brings something truly special that stands out.